Spend the day touring the Zhangjiajie Grand Canyon and enjoy complimentary admission onto the Zhangjiajie Grand Canyon Glass Bridge. This transparent bridge hangs 300m over the canyon and offers a most exciting opportunity to see the breaktaking view of the canyon beneath your feet. 08:30 a.m. our guide will meet you in your Zhangjiajie downtown hotel (Yongding district). Then drive about 1 hour to visit Zhangjiajie Glass Bridge (about 1 hour) and Zhangjiajie Grand Canyon (about 3 hours). 17:00 p.m., drive back to your hotel. Zhangjiajie Glass Bridge ( aka Zhangjiajie Grand Canyon Glass Bridge) is a bridge located in Zhangjiajie Grand Canyon. This transparent bridge is the highest and longest glass-bottomed bridge in the world. It measures 430 metres in total length and 6 metres in breadth, and is suspended 300 meters over the ground said to have inspired the landscapes of the film Avatar. The bridge spans the canyon between two mountain cliffs. The bridge can accommodate 8,000 visitors a day but 10 times as many people wanted access daily. The bridge has set as many as ten world records spanning its design and construction. Located in Cili county of Zhangjiajie city, the Zhangjiajie Grand Canyon is much favored by explorers and lovers of great outdoor from home and abroad, by featuring typical Zhangjiajie landform, breathtaking cliffs, lush forests, ancient caves, colorful ponds, and a river running through the canyon. You have to walk for over 3 hours to visit the canyon, so remember to wear sports shoes and bring some food. You are recommended to start at the top of the canyon and move downhill, these attractions coming into view successively: A Strip of Sky, Sky Ladder Plank Road, Southern Red Flag Canal, Zhangjiajie Grand Canyon Glass Bridge, Barrel Cliff, Flying Fox Rushing Downhill, Pearl Wall & Waterfall of Butterfly Spring, and Swallow Cliff etc. The entrance tickets for the glass bridge can only be obtained by reservation because the park (Zhangjiajie Grand Canyon) has limited the number of visitors per day to 8,000. We have top priority for ticket reservation (individual reservations are seldom accepted). 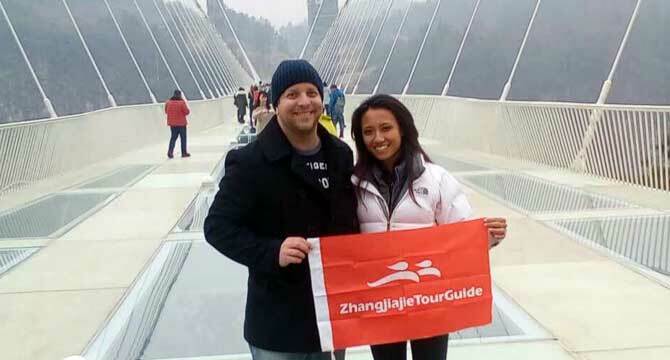 If you book our Zhangjiajie tour packages with the glass bridge, we suggest booking at least 10 days in advance. We don’t offer a glass bridge ticket booking service.